For months now, customers have requested that we serve a turkey sandwich for lunch. We're pleased to announce that we finally found a reliable source of high quality turkey deli meat. We are using free-range oven-roasted turkey breast from Diestel Turkey Ranch in Sonora, California. They raise their birds in a humane fashion without the use of antibiotics and hormones. The turkey meat is free of gluten, casien, phosphates, MSG, nitrates, nitrites, artificial ingredients and preservatives. Finally, a turkey sandwich you can truly feel good about eating! Truitt Brothers new Tetra Pak beans are packaged in an environmentally-friendly carton that saves on transportation costs, storage space, and reduces their overall carbon footprint. The new cartons are attractive, efficient, and best of all, you don't need a can-opener! 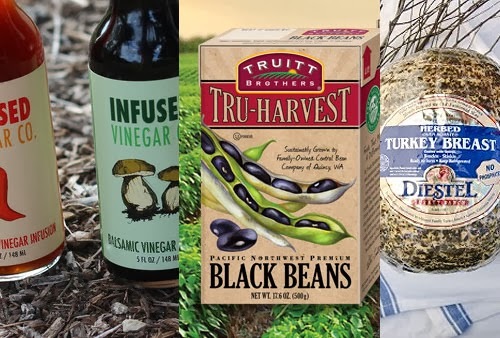 We carry five varieties: navy, kidney, pinto, black, and garbanzo beans, all of which are Food Alliance certified and grown on Pacific Northwest farms. We now carry a small selection of wines from Oregon and Italy. Next time you need a nice bottle of wine with dinner, come see what we have to offer. This new company, based in Eugene, makes some really unique vinegar infusions for food and drink. They have three flavors: Coconut & Goji Berry Vinegar, Apple Cider & Chili Pepper Vinegar, and Balsamic Porcini Vinegar. While these tomatoes are not local, they are some of the best in the world. San Marzano tomatoes are imported from Italy where they are grown with care and harvested at peak ripeness. They have fewer seeds than most tomatoes, and are famous for their sweet and robust flavor. We love using San Marzano tomatoes for pasta sauces and stews. You can definitely taste the difference!